Former prime minister attacks Netanyahu over the investigations against him. Former Prime Minister Ehud Olmert predicted in an interview with Kan 11 News on the weekend that Prime Minister Binyamin Netanyahu will not be re-elected for another term in the wake of the investigations against him. "I believe that Netanyahu’s time in office is up and he will not be the next prime minister. He is using his position to commit extremely serious criminal offenses," Olmert charged. The former prime minister discussed Netanyahu’s decision to break with Israel’s longstanding policy of ambiguity regarding its air strikes in Syria, noting that even during his term in office Israel attacked Syria, but that the attack – on a nuclear reactor in Syria – was revealed only ten years later. Olmert said that Iran is not an existential threat and that Israel's actions in Syria were correct but, in a hint to Netanyahu, added it was important not to mix the attacks with political and personal interests. "We cannot provoke a country like Iran and think that they will not respond. They will be tempted to respond because they will understand that they cannot show restraint after this provocation. The Iranian presence in Syria must be struck as long as it prevents them from establishing themselves militarily. 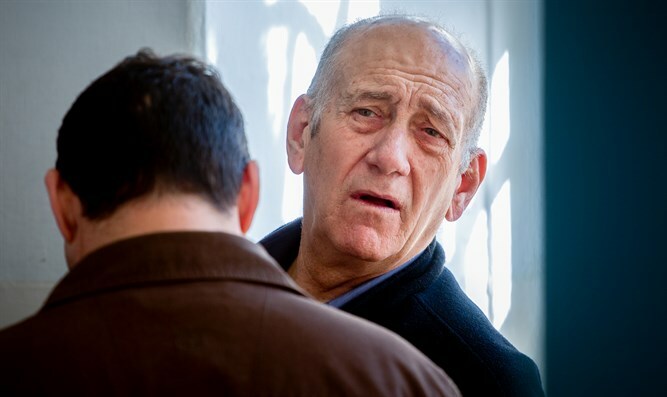 To talk about it provocatively and vulgarly is unnecessary and not serious," Olmert stressed. On the issue of Israel transferring the Qatari money to Hamas, Olmert opined that the transfer of the funds is an evasion of the real problem - the unbearable lives of the residents of Gaza under the Israeli closure. "Most of the residents there are not terrorists. We are making a grave mistake by not creating routes for the residents of the Gaza Strip to make it easier to improve their quality of life. We need to provide them with water and employment, including employment in Israel," said Olmert. The former prime minister, who himself served a prison sentence, referred to Netanyahu's investigations and said, "There is a prime minister here who is undermining the institutions of the law enforcement system. I did not do that. I criticized after I resigned because I did not want to be in a position where I was in a conflict with the law enforcement system while still in office. All the things they claimed that I had done did not happen while I was serving as prime minister."